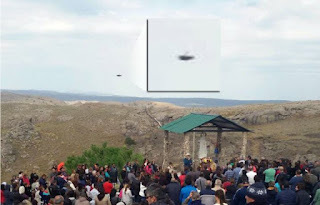 A woman taking photos during the feast of Our Lady of Cobrera in San Lusi noticed a strange presence in the images that is comparable to a UFO. Maria del Carmen Gil took photos during the festivities and upon reviewing them, became aware of the odd element. "I touched the screen to see if it was dirty, showed it to my relatives and no one could make heads or tails of it," the woman told Cadena 3.